“I think it’ll be red or silver,” she said. 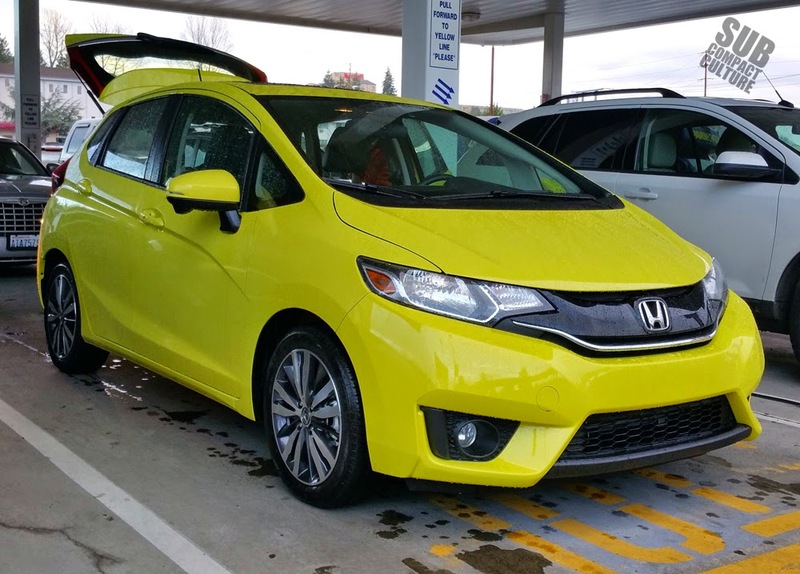 Upon arriving at the Park ‘N Fly at SeaTac International Airport (Seattle), we pulled up to an extremely bright Mystic Yellow Pearl Honda Fit. You couldn't miss it. Usually when we get a car to review, it is dropped off at our house or work. This time, we were flying back from Minnesota and were picking the car up at the airport, then would drive it 170 miles south to Portland. Plus, this would give us a good first impression of Honda’s recently redesigned subcompact hatchback. And although Mercedes had been to the car’s launch last April, I hadn’t had a chance to drive one yet. There’s a new shape to the Fit for ’15. It’s a bit more round; dare I say a bit more roly-poly than the last models. I can’t say I’m a huge fan of the lines, which just keep screaming “round” to me. It kind of looks like it’s holding its breath. At the back, its wide yet slab-sided hips offer up weird proportions. I don’t think the black mesh “vents” in the bumper do anything for its looks, either. And those taillights do look like they were borrowed from the Volvo parts bin. Before getting on the highway, we had to get ourselves—and our luggage—into the car. We needed to fold one side of the rear seats down, but had tons of room for our gear. Once we got in, I found the interior to be laid out nicely with various large knobs for controls, a leather-wrapped steering wheel that feels good in the hands, and an open and airy cabin. Visibility is good without any obstruction from pillars. 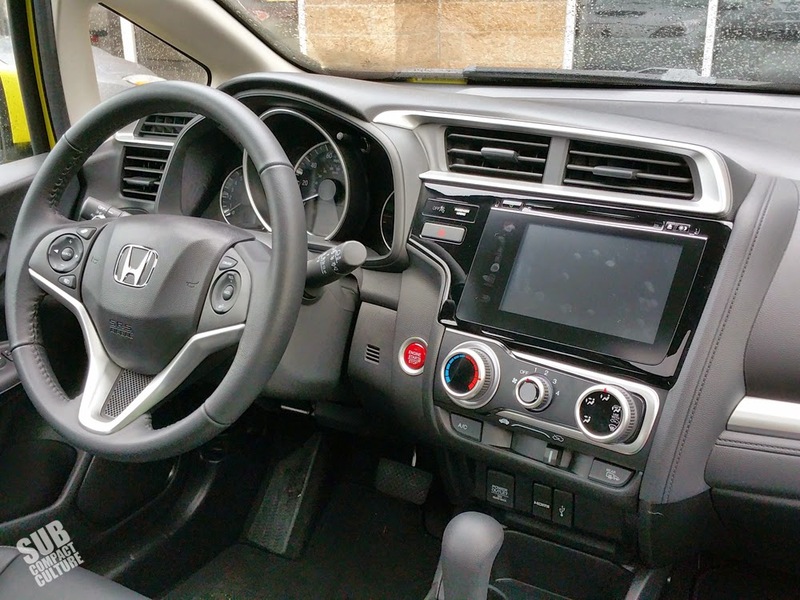 The interior’s overall feel is clean and simple—a trait many Hondas have had for years. Nothing outlandish, just a minimal, modern appearance. 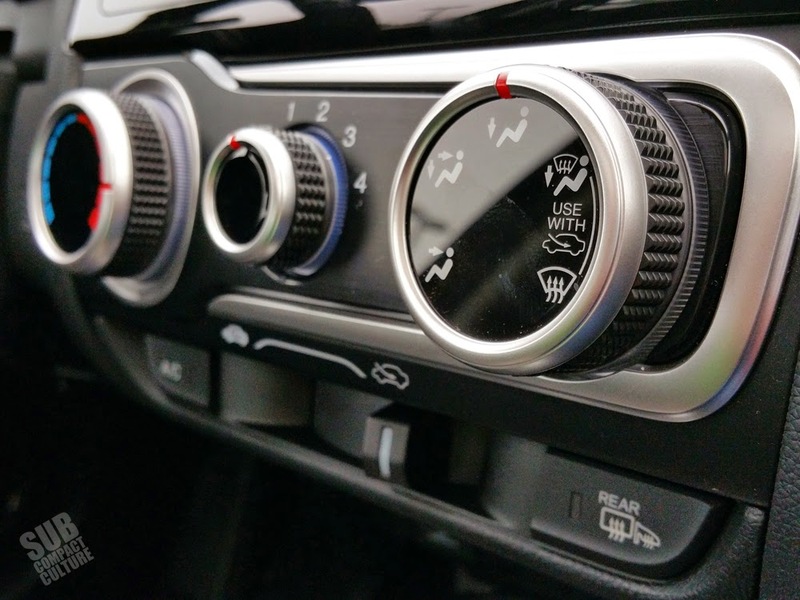 Bonus points for an easy-to-use three-dial climate control system. Fingerprints! This is after about an hour in the car. One thing I didn’t like was the infotainment system’s operation. This touch-screen unit is somewhat difficult to use and has no knob at all, not even for the volume. That means volume is either controlled by swipes on the screen or by using the steering wheel controls. With no tactile bits, there’s no way to turn down the volume quickly. I found steering wheel controls to be the best way to operate the stereo. But really: just about all the functions seem to take more steps than needed. By the way, the stereo wasn’t bad, although no one will mistake you for a rolling discotheque. One thing is for certain: The finish on that touch screen shows every nasty, greasy fingerprint. By the end of our loan, it looks like we had been eating potato chips the entire week, then glomming out meathooks across the screen’s surface. Yes, we may have consumed a half bag of Wisconsin cheese curds on the way home, but that’s another story. We are from the Midwest, you know. 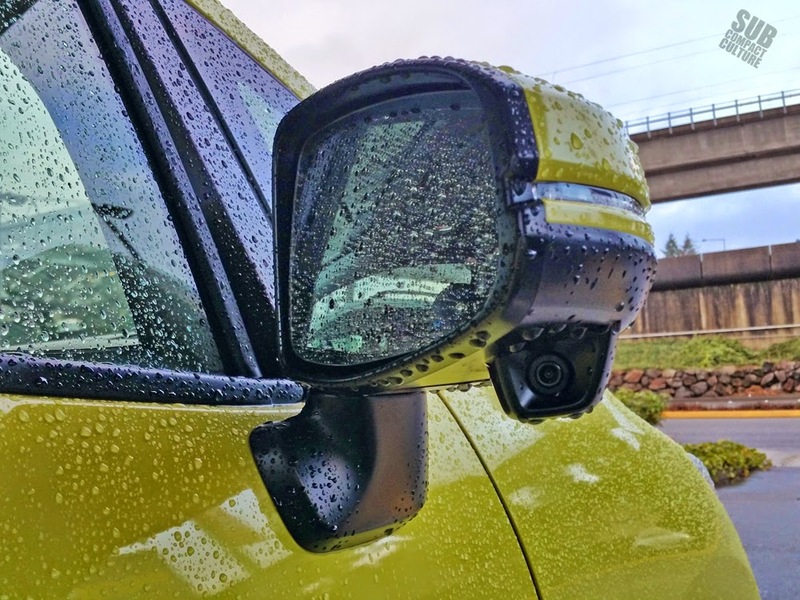 One neat feature, however, is the camera that’s mounted on the passenger’s side mirror. When you signal a right turn, the camera shows what’s next to you on your right. At first I thought this was a bit annoying, to be honest. But then I came to like it. In fact, after I gave the car back, I half expected an image to appear on the center dash of my personal vehicles. All ’15 Fits get one engine: a 1.5-liter i-VTEC engine making 130 hp, up 13 from the last model. Torque is also increased to 114 ft/lbs, up 8 from the last model. 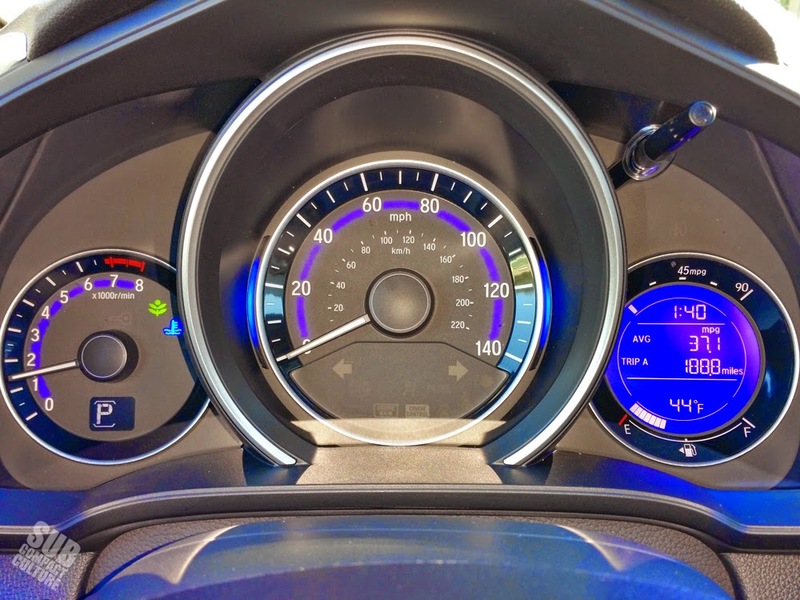 Our tester, an EX-L w/Navi, was equipped with Honda’s CVT, which has paddle shifters on the steering wheel (I still don’t get why any CVT needs paddle shifters). I will say that the bump in power is noticeable. 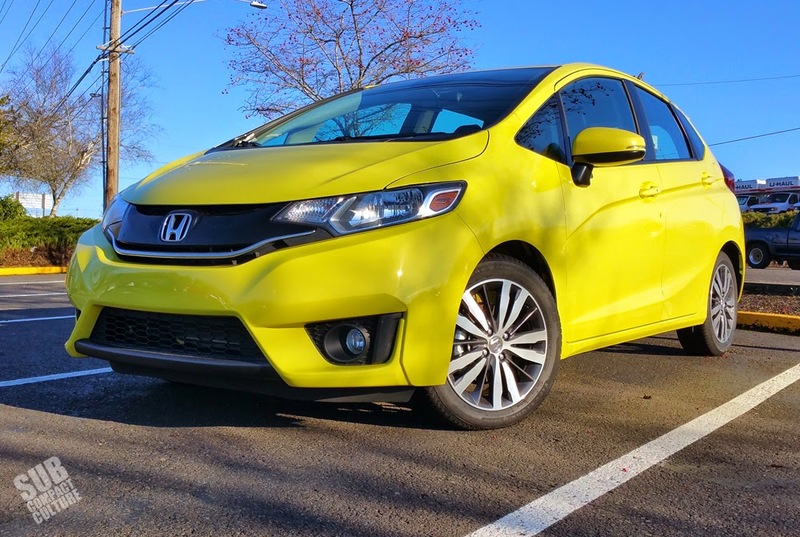 The Fit does get up and go pretty well, even with the CVT. That being said, the engine is noisy and sounded raucous, and that’s only accentuated by the droning nature of the CVT under throttle, which makes the engine sound as if it were powered by bionic hamsters fueled by espresso. (See? Not all hamster jokes refer to Kia.) The car is rated at 32 city, 35 combined, and 38 highway MPG on 87 octane fuel. Not too bad, but not in the coveted 40 MPG category. Our trip computer said we got 35 MPG; a manual calculation yielded 31. 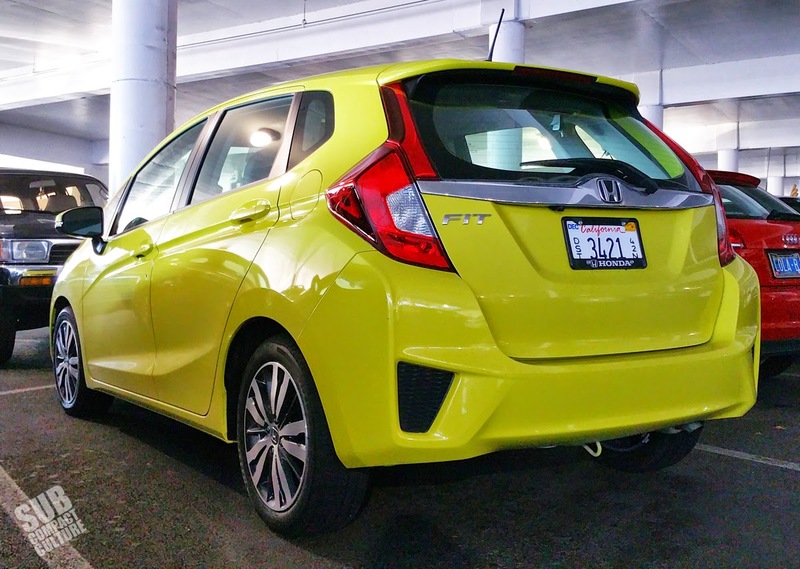 On the highway, the Fit rides with a Goldie Locks quality: not too firm, not too soft. Road noise wasn’t terrible either. I was able to throw the car into the curves a bit, and it reacted in classic Honda fashion with quick, sharp, composed moves. It feels tight and sporting—perhaps not as sporty as previous Fit models, but still agile nonetheless. 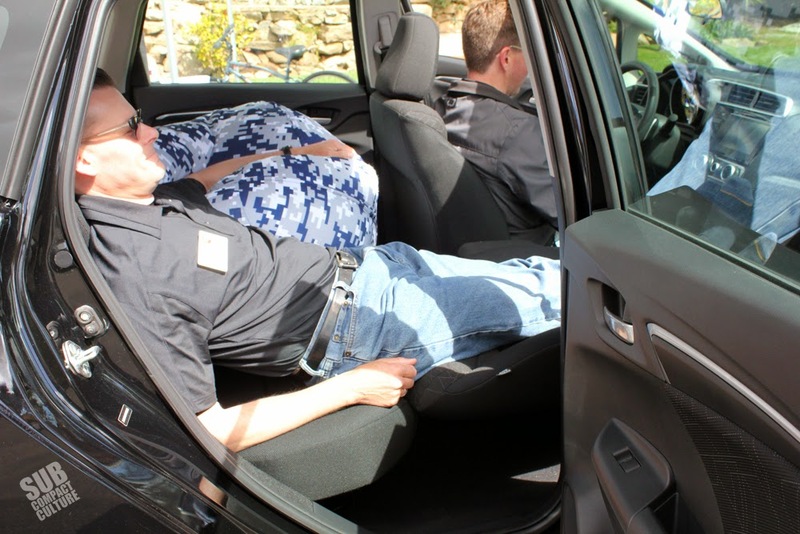 Taken at the 2015 Honda Fit Launch, this is what "Relax Mode" looks like. Ah, Magic Seats! 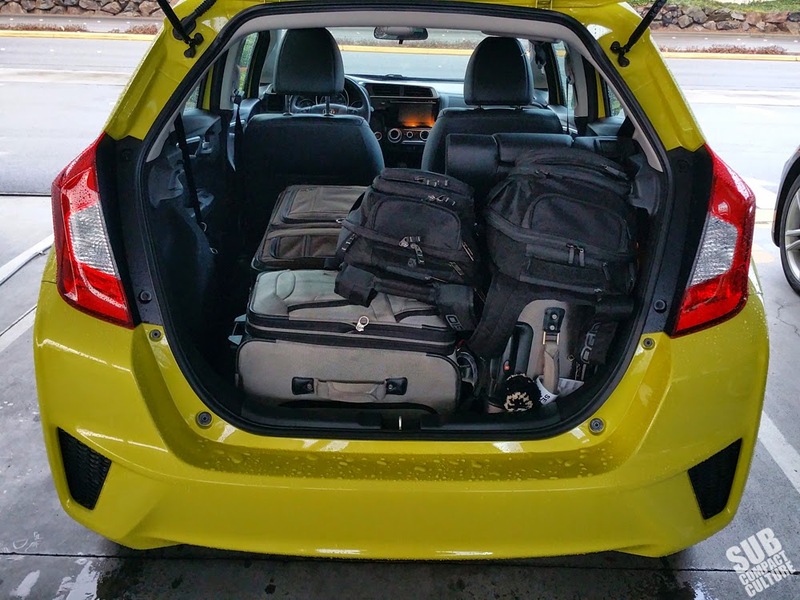 If there is an attribute the Honda Fit has over its competition its versatility. Honda’s Magic Seats, which have been on all Fit models since its North American introduction in 2007, fold flat, tilt forward, and can have their seat bottoms pulled up to make room on the floor for larger items. It’s modular and genius. There’s even a “relax mode” in which you tilt the passenger’s seat back down and put your legs on it while lounging ala chaise so you can sync your smart phone and watch endless cat videos on the touch screen. Meow! The 2015 Fit does a lot right, but something seems to have gotten a bit lost in its evolution. It just doesn't feel as sporty or as energetic as the last couple of generations. It doesn't feel as fresh or spirited. That’s not to say it’s a bad car. It’s far from it. It would still be an excellent choice for anyone interested in a marvel of packaging and interior usability. Maybe it was the CVT, maybe it was the frumpy styling. It’s a great car, it’s just not as much fun as it used to be. Regardless, our Fit EX-L with Navi had a sticker price of $21,590 including destination. This is a loaded, top-of-the-line model, which does encroach on Civic territory, albeit with fewer goodies. It did have heated leather seats, a moonroof, the LaneWatch system (e.g. camera on mirror), and other premium goodies. 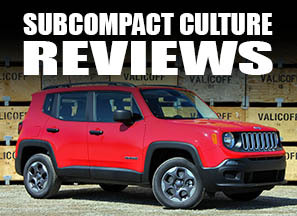 Yes, it’s a good chunk of change, but if you like the looks and want the versatility, the Fit should be at the top of your list for subcompact shopping. While it might have lost a bit of its scrappy nature, it's still a very good all-around choice. Large, easy-to-use knobs are a nice minimalist feature. The Fit's interior is minimal, modern, and functional. The Fit's gauges are easy to read. Camera mounted under the passenger's mirror projects images onto the touch screen while changing lanes. Usually I am not a big fan of the color yellow, but I must say on this car anyway it looks quite cheerful. Easy for other drivers to see it on a rainy day that's for sure. Some additional thoughts about the Fit that would prevent me from buying one. I hate CVT and I loath having anything like that touch screen in any car I own. Why in the world do automakers have to over complicate things. What is wrong with having simple knobs on a car radio for goodness sake. I always buy yellow motorcycle helmets for the same reason. 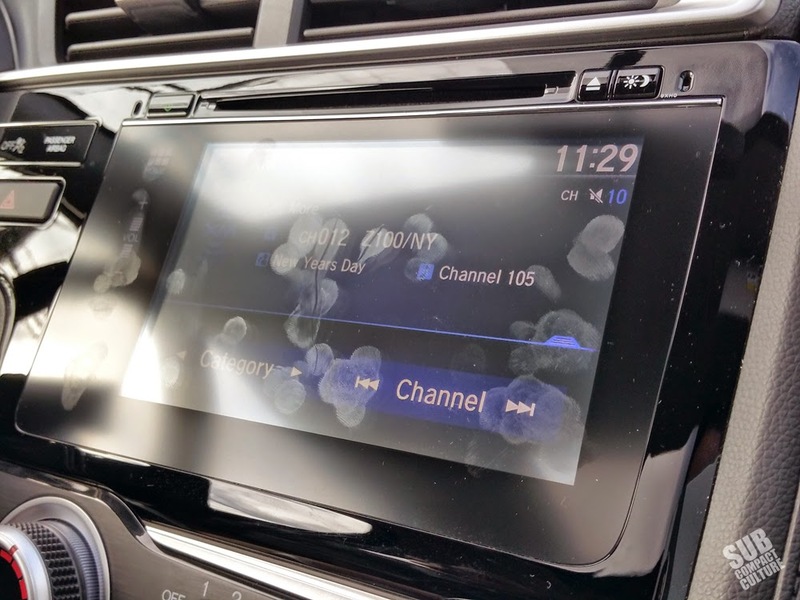 And I agree, too many cars with too much on touch screens. Do we really need all that ? I test drove a '15 Fit LX with the 6-speed manual last night and I think your comment about this new model being less fresh and spirited is spot on. I have an '08 and '11 Fits in the family for comparing the new model to. The first word that came to mind while driving the '15 was "mature" and it stuck over the rest of the ~25 minute drive. I have a feeling it would be more comfortable and less tiring on long trips because it feels smoother and is less twitchy in a straight line. It feels more substantial and solid than the older models and in turn safer, which the crash tests confirm. The reason I bought my 1st gen Fit back in '08 was because of how it drove, the first impression when I drove the '08 was 'light on its feet." It kind of reminded me of my old '83 Rabbit GTI. The steering ratio seems slower and more weighted on the '15, which I think might be part of why it feels less spirited. I note that wife hates my '08 and I think this is because steering is too quick for her tastes - she says it's too twitchy on the highway. The '15 also seems to understeer more than the older fits, at least the the stability control off. I didn't really push the car that hard but as I live in Wisconsin where roads are currently either snow or salt covered (neither are great for traction) and there are lots of roundabouts in the area it was easy to test this. The radio in the LX trim doesn't use a touch screen; it does have a video screen for the radio display and backup camera, but all the functions are controlled knobs and buttons around the screen or on the steering wheel. While the '15s have a 6-speed manual, the gearing in 6th is basically the same as 5th in the older cars: the '15 as well as our '08+'11 are at about 3700 RPM at 75MPH. I find this disappointing since I was really hoping for a higher top ratio which would give lower engine speed on the highway for less noise and better fuel economy. I drove a CVT '15 Fit earlier and as I recall to was closer to 3000RPM at 75MPH and it is rated 4 mpg better (41 vs. 37) in the highway. I imagine Honda left the top ratio low in the manuals the so the engine would closer to the power band at highway speeds giving it a peppier feel and requiring few down shifts for hills and passing. I understand that having owned she pretty underpowered cars in the past, but still I be willing to do some extra shifting for a few more MPG and less engine buzz on the highway. Speaking to peppiness, the extra power of the new engine it nice. It seems to require less revving to get to the power as well - found myself up shifting a few 100 RPM earlier than in my old model. The LX doesn't have the big chrome trim strip across the tailgate and without it I think it looks a little less Volvo like. Overall, I liked to the '15 Fit, and I think my wife would prefer its ride, steering and feel, but honestly I was happy to get back behind the wheel of my 7 year old/127k miles one. To me the new just doesn't have that special feel that set it apart from other small cars. On a side note, I had a '15 Yaris LE hatchback a few weeks ago as a rental and actually quite in enjoyed it. I put 900 miles on it in in 2 days and was comfortable the whole way - not something I could have said about my '08 Fit. 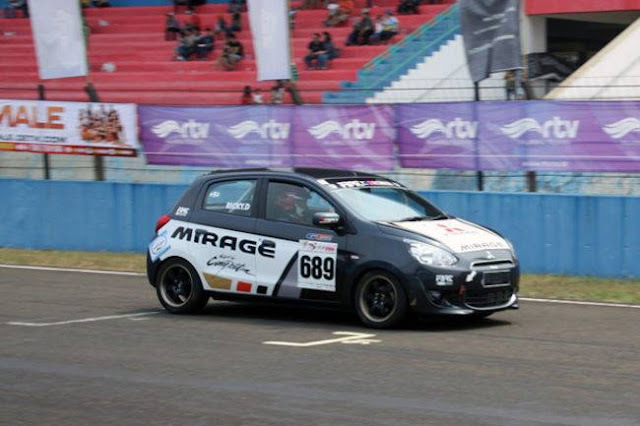 The handling seemed much improved over the '13 Yaris I rented a while back, also a LE. The '13, while comfortable on the highway, was frankly kind of scary when driven quickly around corners due to body lean and bump steer. The '15 had a French VIN and I recall reading that Toyota recalibrated the Yaris suspension for '15, which at least to me, feels much improved in the corners while still comfortable in a straight line. I drove a used '12 Yaris SE after renting the '15, the '15 isn't SE sporty, but it seems like nice compromise.